➢ “The Punisher transcends what it appears to be. Not completely, and not always; this is still a very violent show, saturated in tortured masculinity. But thanks to Jon Berthal’s seamless performance as the non-superpowered vigilante Frank Castle and showrunner Steve Lightfoot’s sharp, conscious storytelling, The Punisher approaches the high points of Marvel’s Jessica Jones by introducing a damaged, deadly character and telling his story as one piece of an unjust whole.” — Variety. ➢ “The series, while technically existing in the worlds of Daredevil, Jessica Jones, and the rest of the Marvel universe, is far less violent than you might expect, and instead is far more invested in its characters and their lives, especially the experiences of former soldiers returning from war. This leads to a far more soulful 13 episodes than anticipated … It’s also, unfortunately, not quite the romp you might hope for from a Marvel series.” — IndieWire. ➢ “The action picks up as the season progresses, but The Punisher never quite gets in touch with the visceral roots of its material, something that all of the other Netflix-Marvel series do, no matter how much they distance themselves from their comic-book sources. It’s handsomely shot (on New York City locations) and smoothly assembled, and its naturalistic, psychological, more moody than pulpy approach may work for non-comics fans who don’t mind some gore with their procedural thrillers.” — New York Times. 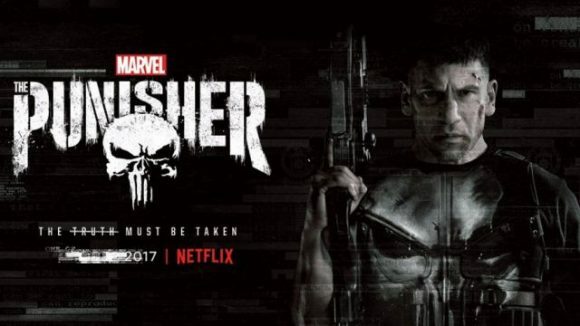 ➢ “Reading The Punisher didn’t make me violent, but watching The Punisher sure made me bored … I suspect anyone who sat through all of the brand’s 2017 output will appreciate The Punisher as ‘A Thing That Is Better Than Iron Fist.’ But set aside the occasional bullet-ballet flourishes and the whiff of government paranoia, and you’re left with something that feels like a melancholy riff on some CBSy procedural like Seal Team. Which isn’t bad. But it ain’t frickin’ good.” — Entertainment Weekly. ➢ “Far better than Iron Fist, Marvel’s latest Netflix stand-alone is a tight, brutal six-episode story of revenge stretched exhaustingly and inexcusably over 13 hours … The Punisher has moments of excitement, moments of bracing violence and a well-cast star at the centre. It’s also tedious for long stretches, and when it comes to plot details, astoundingly forgettable.” — The Hollywood Reporter. It was ok. More disappointing that anything after the chracter’s debut in Daredevil 2. Could have done with more action and less soul searching. Plus did not need anywhere near 13 episodes — 6-8 would have been plenty.